New. Mass market (rack) paperback. Glued binding. 320 p. Stephanie Plum Novels. New. 3 CDs in box. Stephanie Plum Novels. New. Sewn binding. Cloth over boards. 288 p. Stephanie Plum Novels. Janet has done it up good with this one...her quick wit, and humor are awesome. I loved this book as well as the second in the series. Wanted to really like this book. I know she has written tons and they are supposed to be good and funny, it just didn't quite make it for me. Yes, it's funny at times, and the writing is lively, but I found it predictable and trite. I think this is okay for a summer read, but I am not compelled to read the rest of her books. This book is great and an easy read. As other reviews said, You will find yourself laughing out loud at times!!! 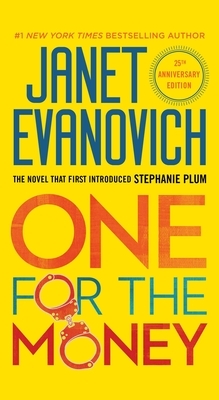 Review of "One for the Money"
This is the book where we get introduced to female-sleuth Stephanie Plum, her mom & dad, Grandma Mazur, Joe Morelli, Ranger, Cousin Vinnie and Lula. Stephanie had been working in Newark as a discount lingerie buyer but got laid off from her job. Her mother mentions Cousin Vinnie has a filing job at his bail bonds company. So Stephanie goes to check it out, only to find that job has been filled. However there is an opening doing 'skip tracing': AKA bounty hunting. The job involves finding people that don't show up for their scheduled court appearance. If she succeeds, she can earn 10% of the posted bond amount. So off Stephanie goes into one madcap adventure after another. This is a great first novel for a great series! I love Janet Evanovich's books. This book was absolutely hilarious as well as suspenseful, interesting, and very easy reading. Great book.